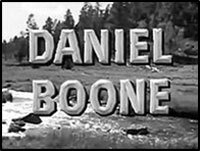 Do You Remember... "Daniel Boone". The ripinest, roarinest, fightinest man the frontier ever knew. And he fought for America to make all Americans free. 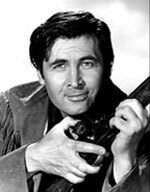 That wonderful tune with lyrics by Vera Matson and music by Lionel Newman introduced six seasons, 165 episodes of NBC’s “Daniel Boone” starring Fess Parker from September 24, 1964 to May 7, 1970. Though highly fictionalized, the 60 minute episodes did loosely follow the famous pioneer’s adventures during the 1770s just before and during the American Revolution. After a color pilot, the first season episodes were filmed in black and white. Strong ratings and demands from Fess forced 20th Century Fox to switch the Thursday night 7:30-8:30 series to color for the next five seasons. 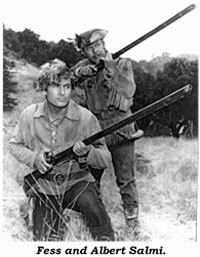 “Boone” struggled in the ratings during the first three years, but under new line producer Barney Rosenzwerg (son-in-law of producer Aaron Rosenberg) as of 1967, the series saw better writing and production values with many episodes becoming more relevant, often centering on slavery and race relations. 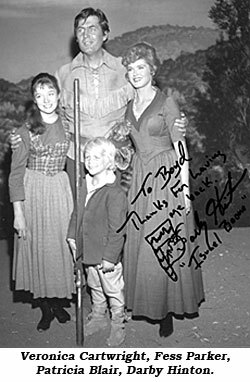 The core cast of characters included Patricia Blair as Rebecca Boone, Darby Hinton as their son Israel, Veronica Cartwright as daughter Jemima (who left the series in ‘66), Dallas McKennon as innkeeper Cincinatus and Ed Ames as Daniel’s Oxford educated half-Cherokee friend for the first four seasons. 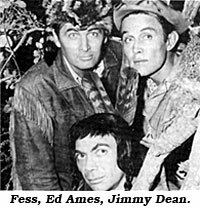 Otherwise, keeping things interesting, “Daniel Boone” employed an ever-evolving cast of characters. 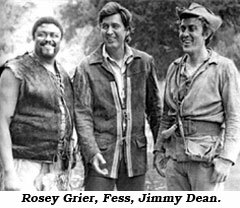 Albert Salmi portrayed Daniel companion Yadkin in season one; Robert Logan came on as young pioneer Jericho Jones in the second season; singer Jimmy Dean was trapper Josh Clements from season four through six; former L.A. Rams football star Rosey Grier made appearances during the sixth season as Gabe Cooper; Don Pedro Colley was freeborn black trapper Gideon for four episodes in season five. Guest stars over six seasons consisted of a mix of established Western vets, up and coming actors and gimmick celebs such as singers Fabian and Roger Miller, boxer Floyd Patterson and comedian George Gobel.